In these regulations the masculine form is used to designate both male and female genders. Eligible for the race are runners born in 2002 or earlier. The participant ensures that the personal data used for the registration is correct and that the race number will not be transferred to anyone else. This alpine challenge is only for very well trained runners. Each participant is fully responsible for his/her own health condition. It can be life threatening to participate in the race, shortly after having an infectious sickness like angina or the flue. The same applies to the use of painkillers or similar medications before the race. Doctors assigned to the course are authorized to pull a runner out of the race on medical grounds. If the race is continued despite the doctor’s advice or after the official control vehicle (sweeper bike/sweeper runner) has passed the runner, a runner does so at his own responsibility and without any entitlement whatsoever to any services of the event organizer. Every runner will receive a personally coded data chip together with his race number. Use of a private data chip is not permitted. The race number must be clearly visible during the race at all times, fixed either on the chest or to a race number belt and it may not be modified or folded. Infringement may lead to disqualification. The data chip must be returned in the finish area. Runners will be charged CHF 50.00 by the event organizer for non-returned data chips. The organizers will not refund any race fees. Neither can any finish places be transferred to the following year. The event organizer must be notified in case an existing finish place is transferred to someone else. A CHF 20.00 administrative fee will be charged for all transfers made on or after July 1, 2017. Should the race be cancelled or only partially run due to safety reasons, the participant is not entitled to a refund of the entry fee nor is the fee transferrable to the following year. The race committee is entitled to make the decision to cancel or break off the race. Each runner must have good equipment suited to weather conditions during the race. The last part of the course is run in an alpine landscape. Each participant is responsible for his/her insurance. The organizer does not assume any responsibility. By taking part in the Glacier 3000 Run, you agree that the organizer is not liable for any kind of damage (accident, evacuation, hospital stay, illness, loss or transport). Furthermore, neither the sponsors nor partners of the Glacier 3000 Run OC are liable for any loss or injury of any kind. Any form of accompanying runners on the course (e.g. with a mountain bike or walking alongside a runner) is not permitted. The use of any kind of aids (e.g. poles, spiked shoes) is not allowed. Both will lead to disqualification. Jogging instead of walking, as well as the use of any technical aids (except for the normal walking sticks), is not allowed. Infringement can lead to disqualification. The Glacier 3000 Run OC supports the basic idea that Nordic Walking is a healthy adventure sport. Therefore there will be neither a ranking list nor ranking announcement for this category. A finish list (with times) in alphabetical order will be made. The last control vehicle (sweeper bike / sweeper runner) marks the end of the race. After this control vehicle has passed, the stretch will be reopened to other users. Runners overtaken by the sweeper’s bike/runner are no longer part of the race. The jury (race organizers and medical team) decides about any disqualifications. Possible reasons for disqualification are incorrect information about the runner (name, age), giving your race number to someone else, unprofessional conduct (e.g. not running through a time station, taking shortcuts, running without a valid race number, using any kind of aids, disregarding official instruction and doping). Objections must be written and handed to the person in charge of the finish area within 30 minutes of crossing the finish line. Anyone who drops out during the race must notify the next first aid station and return the data chip there. Runners will be charged a CHF 50.00 fee for non-returned data chips. The costs for searching a runner who has not provided proper notification for dropping out will be charged to the runner involved. The race number entitles runners to free transportation to the finish area to pick up personal belongings and then to return to the finish area (Glacier 3000 mountain railways / Shuttle Bus). Changing areas and showers are located in the finish area by the ice rink in Gstaad. Only a changing area is available in finish area at Glacier 3000. Personal items and clothing (baggage) will be transported to the finish line. The baggage (max. 5 kg/person) must be deposited by 9.45 h the latest (8.15 h for marathon runners) using special bags available at race number pick-up at the ice rink premises. The baggage will be deposited in the finish area. Teams are responsible for bringing their baggage to the transfer area in Reusch themselves. Baggage for the second runner in the team must be deposited by 9.45h before the race start at the ice rink premises. Alpine Nordic Walking: Baggage deposit at Oldenegg station is possible until 11.10 h at the latest. Medical services are available at various points throughout the race – refer to course map. Experienced sports masseurs from „BeoSpoMaTeam“ are offering special pre-race and after-race massages. These services are free for all athletes at the ice rink premises. The information booth and place for depositing valuables are located on the ice rink premises in Gstaad. Any found items can be deposited there as well. The event organizer is not liable for any items stolen from the changing areas. If fewer than three runners are classified in one category, this category will be cancelled and runners assigned to the preceding age-group category. (Juniors will be assigned to the next oldest category). Prize monies will be awarded to the top three women and men for the categories Overall Run. A non-cash prize will be awarded to the top three finishers of each category. Each runner who crosses the finish line at Glacier 3000 will receive a prize after the data chip for time measurement is returned. The coupon for pasta (redeemable in the refreshments area at the ice rink premises in Gstaad) is attached to the race number (stripe on the side). Doping controls may be conducted at any time. It is the responsibility of each participant to ensure that any medicine, supplement or similar substance taken does not contain any unauthorized ingredients. See www.dopinginfo.ch/en for more information. By registering for the race, participants automatically give permission that their first name, last name, year of birth, city of residence, nationality, race number, race time and ranking in the start and ranking list can be published. This permission also applies to publication on the Internet, print media, TV, Teletext and for notice board and speaker announcements. Photos and video in connection with the race event can be used on TV, Internet, in our own advertising tools, magazines and books without any right to remuneration. Participant names, postal and email address may be given to partners (e.g. photo and video services) for services or advertising purposes, as will as to sponsors upon request, with regards to targeted mailings related to the race event. There must be a minimum of three runners in a category for it to be rated separately. Late registration fees do not apply here. Each participant will receive a prize. 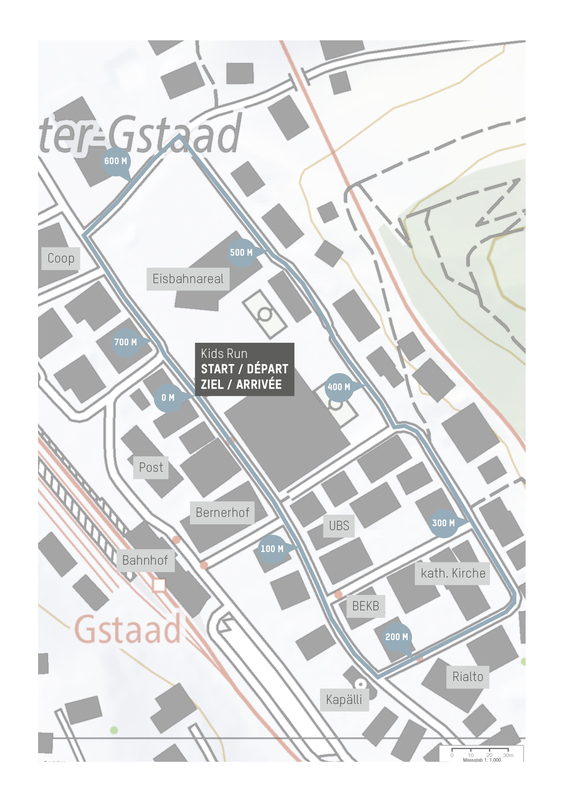 The course is a loop in the center of Gstaad. The course is marked with plastic tape. A runner will be disqualified if he leaves the course or takes a shortcut during the race. The instructions along the course must be followed. Changing rooms are available at the start and finish areas at the ice rink premises in Gstaad. The changing rooms/showers at the ice rink premises in Gstaad may be used after the race. Insurance is the sole responsibility of each participant. The event organizer does not assume any kind of liability. For online registration, payement is due online (datasport).